IF you are twiddling your thumbs now Semana Santa is over, fear not – Andalucia’s best festival season is about to start. 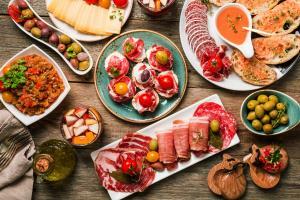 Vibrant flamenco dresses, late-night dancing, wine swigging and sampling some of the best seafood in Spain are set to take over the region throughout April and May. Seville’s April Fair is considered one of the biggest and best annual events in Spain and is almost as famous as the city’s legendary Semana Santa processions. 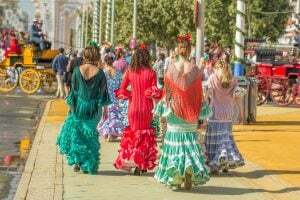 Expect flamenco dancing, traditional Sevillan music, fairgrounds, bullfights, the very best in Andalucian wine, jamon and cheese and a whole lot of polka dots. A huge area in the south of the city is taken over by a small ‘town’ of casetas (tents and pavilions) where the parties continue well into the evening. The colourful week-long party is truly a sight to behold as horses parade through the music-filled streets. Every year thousands of visitors flock to Granada to experience the Day of the Cross, which has been celebrated since the 17th century and is still one of the most popular festivals in Andalucia today. For one day, the city’s streets are covered in colourful flower and pottery adorned crosses, with an annual competition held for the best decorated crucifixes. Women and children dust off traditional flamenco dresses and take to the city’s streets to dance and sing around the crosses. Horse processions, flamenco shows and some serious eating and drinking make the festival a must-see in Andalucia. Seafood lovers rejoice – a festival dedicated entirely to prawns, clams and anchovies takes over the quaint coastal town of Punta Umbria every April. Located in Huelva – named the Spanish Gastronomy Capital 2017 – the port town has celebrated its independence with the seafood fair for almost 25 years. Thousands gather in the centre to the sound of live music, while a million prawns are sampled and bought by seafood fanatics. Jerez is not only famous for its sherry but also its annual horse fair, which is renowned for being the most outstanding of its kind in Spain. The festival is not just a celebration of one of Spain’s most symbolic animals – it is also an excuse to sample some of the finest sherries in the world, while watching the dressed horses parade through the streets with equestrians donning equally spectacular outfits. Dating back to the 1500s, the city is full of traditional flamenco dancers and exquisite food and wine tents. Considered the oldest pilgrimage in Spain, the Romeria de la Virgen de la Cabeza, dates back to the 13th century and takes place just outside of the village of Andujar. Every year around half a million make the pilgrimage to gather in the sanctuary of El Cerro del Cabezo, dressed in typical Andalucian clothes riding horses. During the night, crowds sing and dance in front of the sanctuary before the last day of the festival, where the procession of the image takes place.